The one where she talks about hair oils. I have a shocking fact for you. A couple of years ago, I didn’t even use conditioner. I thought it made my hair greasier, quicker and I just hated it. Fast forward to me now, and I happily use pre-shampoo hot oils, deep conditioner left on for 30 minutes(!) and slather hair oil on my damp hair like it’s going out of fashion. My hair is naturally wavy and very frizzy, and so anything that can be used in an attempt to tame it, I use with wild abandon. My first hair oil was the VO5 Concentrate Elixir – I slicked it on damp hair and loved how shiny it made my hair. 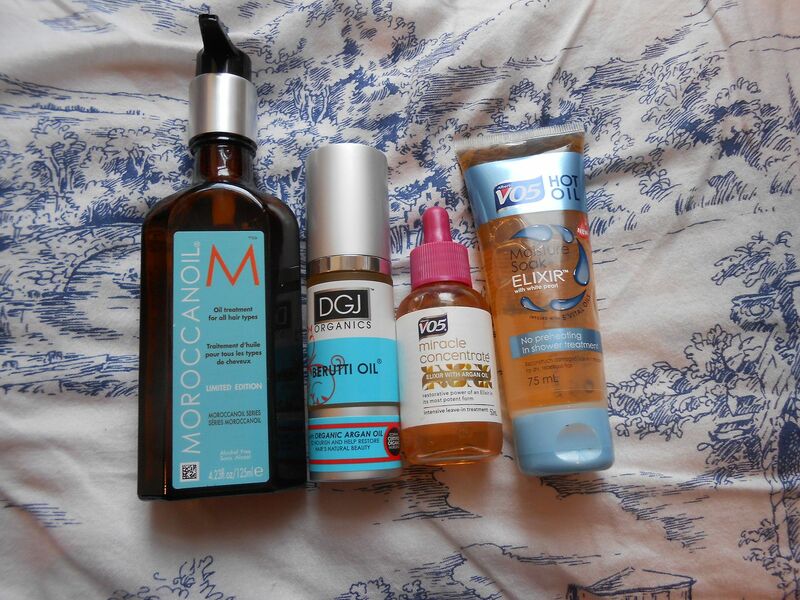 The consistency is quite fluid and the effects aren’t as amazing as my beloved (preciousssss) Moroccan oil, but it definitely helps with frizz and is a little bargain at just over £5 – link! Next, I was gifted a bottle of Moroccan oil. Now, this does live up to the hype. It is expensive, but I’ve been using this for agesss and my bottle still has just under half left. I use 2/3 pumps of this through the ends of my hair after every wash and it helps my hair to dry quicker, and be smoother. I think this product is also the reason for why my hair has grown so quickly in the past year or so. You can buy a 25ml bottle for £12.85 – link! The newest oil in my stash is the DGJ Organics Berutti oil*. This has the richest, thickest consistency and smells the nicest. It smells a bit like sweets and something I can’t quite put my finger on – delicious anyway. This one doesn’t seem to help with drying time but it definitely makes the ends of my hair sleeker, and my blond bits at the end seem softer. This is nicely priced at £7.99, and I think will last the longest because it’s soooo rich – link! Lastly, an oil which you put on before shampooing… The VO5 hot oil treatment. The concept seems weird to me. Another VO5 gem, one that you put onto wet hair, leave for one minute and then wash/condition as normal. This made my hair look much sleeker after use, and it dried with less frizz. Awesome! It costs £4.29 and has about 5 uses in it – link! Do you use hair oils? Do they make a difference to your hair?